The story of Srinivasa Ramanujan, an Indian student at Cambridge self-taught in mathematics and eventually becoming a major figure amongst his peers for his supreme intellect, is one that has surprisingly not had the major film treatment until now. You’d reckon that with so many other films out there about pioneers in modern science and technology like The Imitation Game or The Theory of Everything that there would have at least been one by now about this guy, but it’s all too sad that only now, over one hundred years since his birth, Ramanujan’s story is being told for audiences who don’t even know his name. Blame whatever you want on its constant delay to the big screen, whether it be the depressing reluctance of major studios to fund a major film about a non-white character or the general lack of audience interest in mathematics as a subject, but just be thankful that his story is finally being told to the masses. As it stands, The Man Who Knew Infinity – based on the biographical book of the same name by Robert Kanigel – is a reasonably decent starting point for people to learn more about the man himself (played by Dev Patel, who does well here but you have to start wondering whether he’s starting to get sick of being typecast as the Indian guy in every major Hollywood film nowadays) and his relationship with Professor G. H. Hardy (Jeremy Irons) among his other personal successes, except for – surprisingly – his actual mathematical abilities. The oddest thing about the film is how it doesn’t seem to focus on Ramanujan’s actual love and passion for all things numbers, and instead it revolves more around who the man actually was in real life. It’s a noble gesture, one that certainly makes it a more human narrative than most other biopics that try and fail to represent their subject, but the film doesn’t explore exactly what made him such a prodigy in the world of mathematics to begin with, let alone be placed in the same class as the likes of Isaac Newton. There are almost no scenes that show how Ramanujan came to truly become so gifted or where such a passion came from – we are introduced to him already being such a genius with numbers whilst living in poverty in India – nor any that go into much detail about why it is so close to his heart. You at least understood the respective passions of Alan Turing and Stephen Hawking and where they stemmed from in those previous films, but by neglecting to actually hone in on what made Ramanujan truly great, other than he was a bright fish-out-of-water student in Cambridge during the First World War when racial tensions were high, it’s a slight disservice to the real-life figure as well as to audience members who want to know exactly what made him stand out other than he was just really good at maths. Writer-director Matthew Brown moves things along at an amiable pace, allowing time for Ramanujan and Hardy to interact and build a strong working relationship as they attempt to win over prejudiced and uninterested lecturers. Patel and Irons do genuinely work well together, and both actors deliver strong emotional performances that earn empathy in the right places. In fact, they share better on-screen chemistry than between Patel and relative newcomer Devika Bhise as his wife Janika, who is fine as an actress but cannot help but feel slightly lost when in scenes with her on-screen husband, which make them slightly awkward as far as spouse-bonding scenes go. In fact, the sections wherein Janika is waiting patiently for Ramanujan to correspond with her while she remains in India are the weakest parts of the film, not so much because of the performance, which again is just fine, but because some of the choices for what happens in these scenes that draw a wedge in their marriage is somewhat pantomime and contrived. Once you look past those minor hindrances, The Man Who Knew Infinity is mostly a harmless and completely serviceable product designed to introduce general audiences to the story of Srinivasa Ramanujan, one that doesn’t offer much in saying what exactly makes him so unique thanks to its admittedly disappointing lack of focus on his actual mathematical abilities, but gets by on a fairly decent uplifting tone and two good lead performances, which are enough to not necessarily put it in the same company as The Imitation Game or The Theory of Everything, but close enough for you to feel glad you saw it. 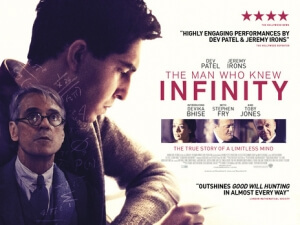 The Man Who Knew Infinity is harmless biopic fodder, anchored by two strong lead performances by Dev Patel and Jeremy Irons, but its lightweight approach to the work and genius of Srinivasa Ramanujan make this a lesser film than perhaps the subject matter deserves.